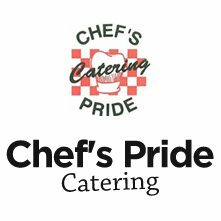 Plated Dinner $50.00 – Chef's Pride Catering, Inc.
Pricing is based on all guests having the same salad, vegetable, potato, and choice of two main entrees. Service includes: Wheat, white dinner rolls, sliced baguettes and butter and served in a basket at each table. Choice of two dressings: Ranch, Cherry balsamic vinaigrette, Poppy seed, Cajun buttermilk, Italian, White French, Balsamic vinaigrette,1000 islands. I will personally meet with you to discuss any layout and setup preparations. Once the menu selection is confirmed you will receive a very detailed confirmation letter about your event. Such as arrival time of guests, timing on when you would like your bar open, what time you would like dinner served, toasts, and serving of cake or dessert table. ﻿Price Quote with a minimum guarantee of 100 guests.